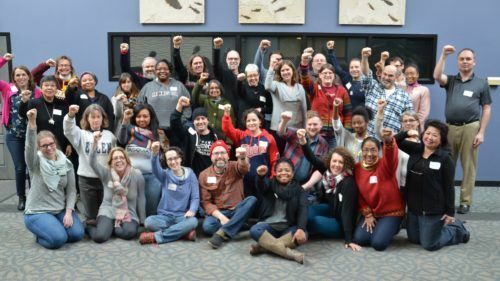 The SPFT TIGER Team gathers for a group photo after their first training in January 2017. 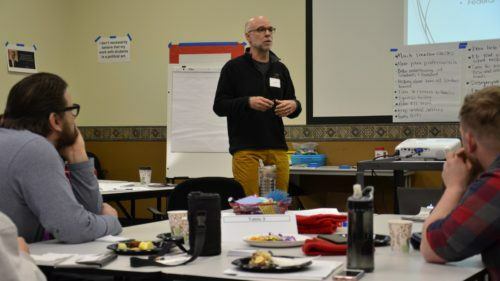 SPFT President Nick Faber addresses the TIGER Team at their first meeting. 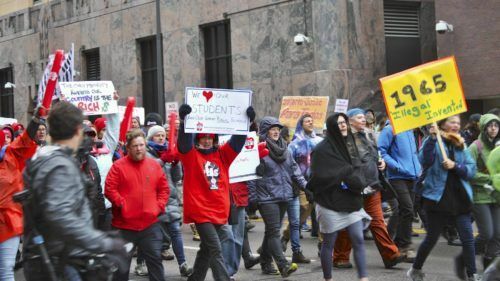 Members march in the 2017 May Day rally in downtown Minneapolis, supporting immigrant students. 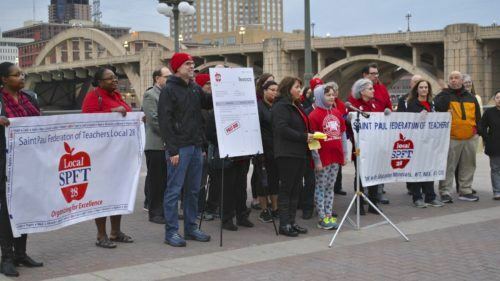 SPFT kicked off our contract campaign at US Bank, who has been avoiding paying property taxes. Property taxes are the main source of local funding for schools. This is a problem in Saint Paul, where one in four properties do not pay any property taxes. These properties are either owned by a public entity – the city, county, state or school district – or are part of a non-profit tax-exempt organization. Private colleges and hospitals, in particular, own some of the most valuable property in the city, but do not pay any taxes on it. Five non-profit organizations (Allina, HealthEast, HealthPartners, Macalester, and St. Thomas) alone own a total over 100 properties in St. Paul with a combined value of $1.4 billion. If these five institutions paid property taxes at the same rates as businesses, Saint Paul Public Schools would bring have an additional $10 million, which would help ensure that every child receives the education they deserve. Around the country, cities, counties, and school districts have worked out agreements directly with local universities and hospitals regarding voluntary payments in lieu of the property taxes. This type of program is known as a PILOT (Payment in Lieu of Taxes) and is in effect in cities including Boston, Baltimore, and Pittsburgh. Our students in Saint Paul need this money in order to receive a high-quality education. Schools in Minnesota have some of the worst outcomes for students of color in the country. The chronic understaffing of our schools leads to students academic, physical, and emotional needs not being met. It also leads to an increase in school suspensions. Suspensions increase the likelihood of a student dropping out of school, which makes them more likely to end up in the school to prison pipeline. We need to fund programs that will ensure success for every student in Saint Paul, especially our students of color, and the wealthy meds and eds in Saint Paul are obligated to help out. Sign our Petition: Tell Macalester and St. Thomas to Pay their Fair Share!